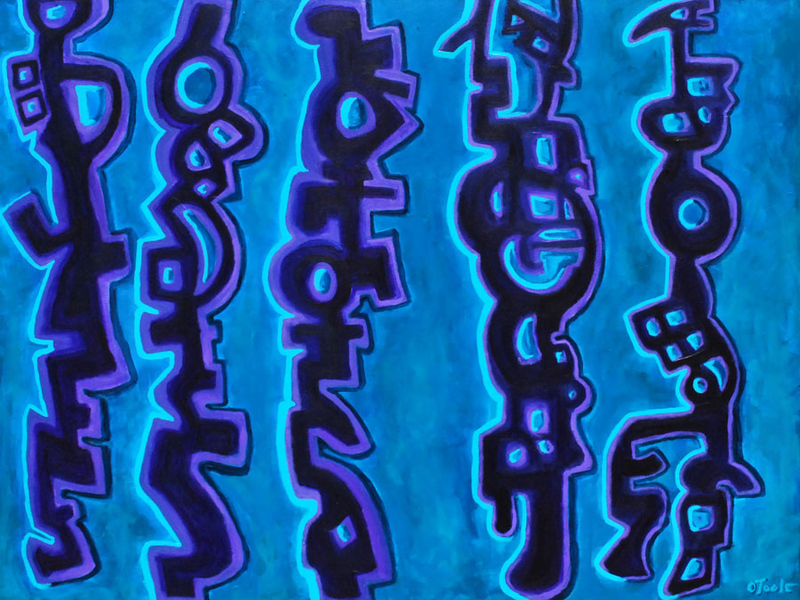 Acrylic on 36″ x 48″ canvas – Original painting $2750. Step 5 in the 12 step tradition reads, “We admitted to God, ourselves, and another human being the exact nature of our wrongs.” This is only possible after accomplishing the four previous steps, which begins with the honesty and humility of first admitting powerlessness over anything that does not originate from within ourselves. This is followed up by a searching and truthful moral inventory of ourselves, digging down to the core reasons behind our behavior. In this abstract pictograph, the individual in question reveals to the God of their understanding and another person the results of this inventory. The “wrongs,” “character defects,” or “shortcomings” are still with the confessor, as they have yet to be removed. In later steps the individual must first become ready for their removal and then, humbly ask the God of their understanding for help in the form of doing for them what they cannot do themselves; i.e. removing these exposed personal flaws. To date this has been one of the most difficult and rewarding parts of my own recovery. Not only because it involved digging down into, and being honest with myself, but also involved learning to trust myself, someone else, and especially, God. That may sound odd to some, not being able to trust God. However, it turned out to be key in improving my attitudes toward myself and others, and thereby beginning the healing process. For additional information of this original painting, including purchase details, visit our sales page.